This week I went with 3 other ladies from Las Vegas to a training in Charlotte, North Carolina for new councils of Girls on the Run. Founded in 1996 by Molly Barker, the mission of Girls on the Run is to “educate and prepare girls for a lifetime of self-respect and healthy living.” This is done through a 12-week, 24-lesson curriculum that empowers girls to celebrate their bodies, embrace their gifts, and honor their voices, while also training for a non-competitive 5k run at the end of the season. Needless to say, I am very excited about being a part of the group who is working to establish and launch the first Girls on the Run council in the state of Nevada. 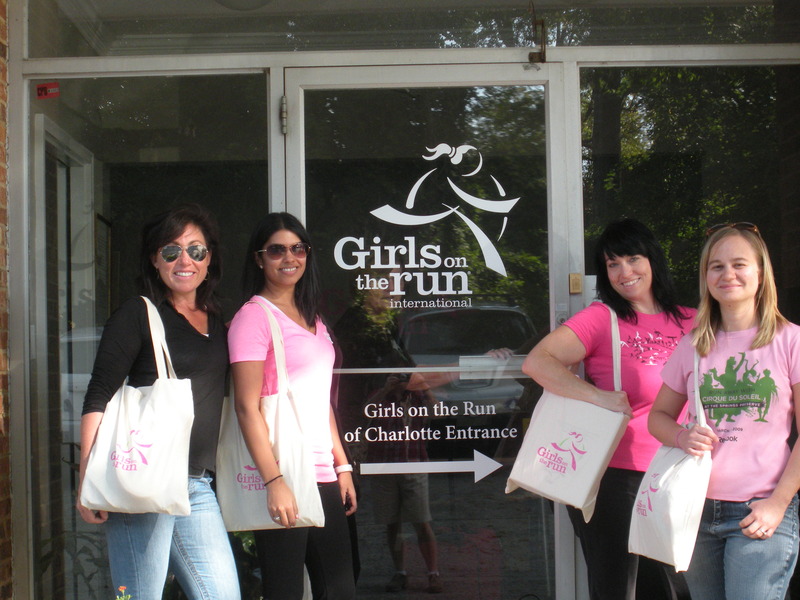 Our group from Vegas at the Girls on the Run International office in Charlotte. From left to right, Stephanie Lasure (Council Director), Veka Rehman, Elisabeth Daniels and me. At the training we learned all aspects of establishing a non-profit organization and carrying out the Girls on the Run curriculum – from establishing our board of directors and applying for 501(c)(3) status, creating a budget, recruiting volunteers, to fundraising. We met and participated in several lessons with Girls on the Run Founder, Molly Barker, who is an amazingly inspirational woman full of energy. If you get a chance, read more about her biography. In Charlotte, our Las Vegas group was joined by other new councils from San Antonio, TX, Galveston, TX, Oklahoma County, OK, Prince George County, MD, and SW Washington. We now join over 160 councils throughout the US and Canada with over 62,000 girls and 33,000 volunteers participating in the program annually. “Like” Girls on the Run – Las Vegas on Facebook to stay informed on current happenings. Contribute financially by sending a check made out to “Girls on the Run” to Girls on the Run Las Vegas, c/o Stephanie Lasure, 322 Karen Ave. Apt 2404, Las Vegas, NV 89109. Once we get our website functional, you can also donate online via credit card. If you’re a runner, learn how to can participate in the Girls on the Run Sole Mates Program, to raise funds for our local council by participating in a marathon, half-marathon, triathlon or other sporting event. Sign up to volunteer as an assistant coach, running buddy, member of our board of directors, or as a part of our fundraising, marketing or 5k planning committtees. Attend our launch party/mixer to learn more. Details will be posted shortly on our Facebook page. This entry was posted in Healthy Living, Las Vegas and tagged Girls on the Run, Las Vegas, non-profits, Running, youth empowerment. Bookmark the permalink.